Can I upload files (invoices, receipts, etc.) for my expenses? Yes, you can upload files for each expense you enter in LSP.expert. After you created an expense (by clicking on the "Add an expense" button under Accounting > Expenses), the system will ask you if you want to upload a file for it (invoice, receipt, etc.). 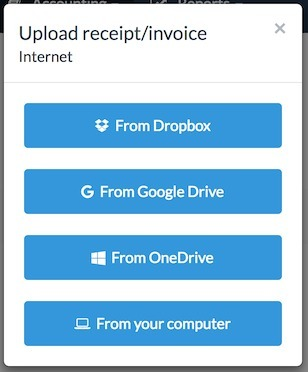 You can upload files from Dropbox, Google Drive, OneDrive or your computer. You can of course choose not to upload any file by clicking on the little cross in the right corner. You can also upload a file later, by clicking on the corresponding button on the right of the expense line. If you choose to upload a file, it will appear below the expense. You can delete it by clicking on the red cross or download it by clicking on the cloud.